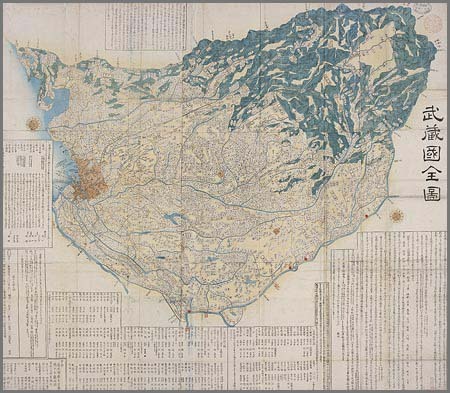 This is a map of the 22 counties of Musashi Province. 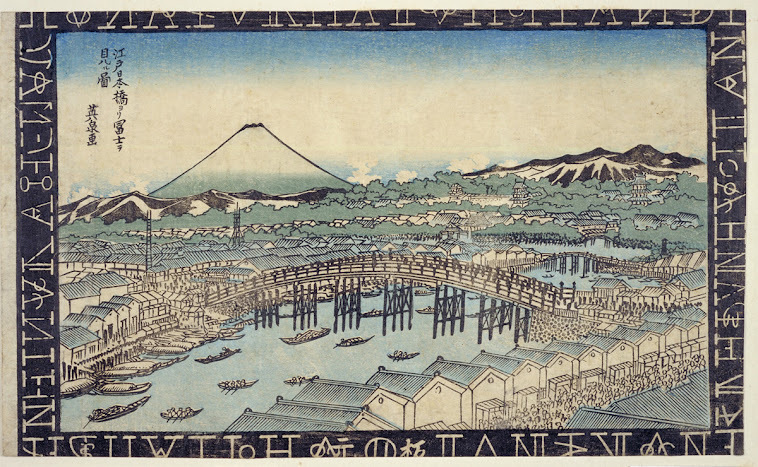 Rivers, marshland, and the ocean are drawn in blue, mountainous areas in green, and the confines of the city in deep colors to distinguish from the outskirts. Also, in the blank space an explanation of place names, a brief history, a list of temples and shrines, and a list of famous spots of Musashi Province are noted. Musashi Province is a large region that covers the present day Tokyo Metropolis, Saitama Prefecture and a large portion of Kawasaki City and Yokohama City in Kanagawa Prefecture. 豊島 Toshima, 荏原 Ebara, 橘樹 Tachibana, 久良岐 Kuraki, 都筑 Tsuzuki, 多摩 Tama, 足立 Adachi, 入間 Iruma, 比企 Hiki, 横見 Yokomi, 埼玉 Saitama, 大里 Ohsato, 男衾 Obusuma, 幡羅 Hara, 榛沢 Hanzawa, 那賀 Naka, 児玉 Kodama, 賀美 Kami and 秩父 Chichibu. However in the 8th century, the Koma County and the Shiragi County (which later became the Niikura County) and in the beginning of Edo period, a part of the Katsushika County of Shimōsa Province were integrated to make 22 counties. was a province of Japan, which today comprises Tokyo Metropolis, most of Saitama Prefecture and part of Kanagawa Prefecture. It was sometimes called Bushū (武州). The province encompassed Kawasaki and Yokohama. Musashi bordered on Kai, Kōzuke, Sagami, Shimōsa, and Shimotsuke Provinces. Musashi was the largest province in the Kantō region. The name Musashi, recorded in early records as 牟射志 muzasi, has been conjectured to be of Ainu origin. It has no apparent meaning in Japanese, but mun-sar-i or mun-sar-ihi (weed-marsh-POSS) is a hypothetical Ainu form that would mean "marsh/wetland of (i.e. belonging to) weeds/inedible or otherwise useless plants," with Musashi in the middle of the Kantō Plain. Musashi had its ancient capital in modern Fuchū, Tokyo, and its provincial temple in what is now Kokubunji, Tokyo. 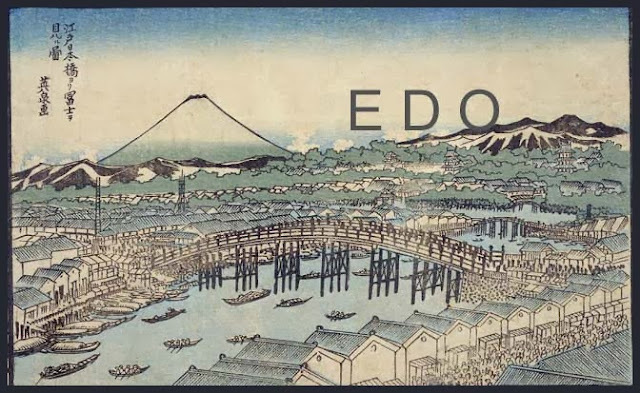 By the Sengoku period, the main city was Edo, which became the dominant city of eastern Japan. Edo Castle was the headquarters of Tokugawa Ieyasu before the Battle of Sekigahara and became the dominant city of Japan during the Edo period, being renamed Tokyo during the Meiji Restoration. was designated as the chief Shinto shrine (ichinomiya) of the province; and there are many branch shrines. The former province gave its name to the battleship of the Second World War Musashi. 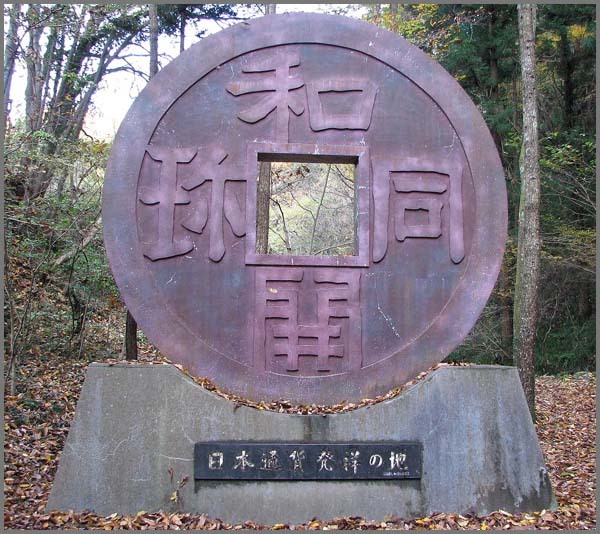 The era name was about to be changed to mark the accession of Empress Gemmei; but the choice of Wadō 和銅 as the new nengō for this new reign became a way to mark the welcome discovery of copper in the Chichibu District of what is now Saitama Prefecture. The Japanese word for copper is dō (銅); and since this was indigenous copper, the "wa" (the ancient Chinese term for Japan) could be combined with the "dō" (copper) to create a new composite term—"wadō"—meaning "Japanese copper".
. Ebara district, Himonya village 武州荏原郡碑文谷村. .
. Fuchuu, Fuchū 府中市 Fuchu city .
. Higashimurayama city 東村山市 and 久米川村 Kumegawa village .
. Itabashi ku 板橋区 Itabashi ward / 武州板橋 Bushu Itabashi .
. Kichijoojimura 吉祥寺村 Kichijo-Ji village .
. Kodaira shi 小平市 Kodaira city and 小川町 Ogawa district .
. Machida shi 町田市 Machida city "city of fields" .
. Musashino Plain 武蔵野 Musashino Uplands . A part of the 関東平野 Kanto Heiya plain.
. Musashi Fuchu Kumano Jinja Kofun　武蔵府中熊野神社古墳 burial mound .
. Tamagawa 多摩川 / 玉川 River Tamagawa, Tama .
. Shrine Musashi Mitake Jinja 武蔵御嶽神社 . Seals have been living in the rivers of Musashi province and many are born in spring near the sea. When they grow up, they become sea lions, but later in their life they go back to be seals. When the Bora gets older, he changes his form, even becoming a sea lion or a seal. This fish is born in the Musashi province and then moves on South, where he spends about one year in the sea at 紀州 Kishu, Wakayama. He is never caught there in a net or with an angler's hook. A few years older he turns back into a seal. Since he likes the cold, he now moves up to Hokkaido to live there.
. - Suiko 水虎 Water Tiger, Water Beast - . 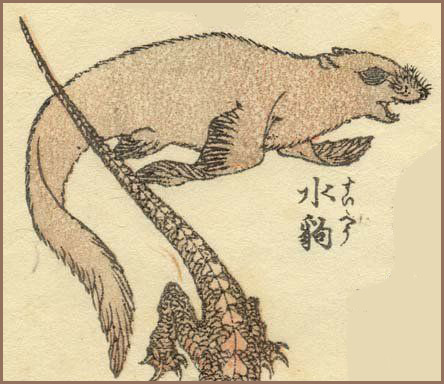 This is a kind of Yokai monster weasel or small fox with a split tail, also written 尾先, 尾裂」「御先狐」or「尾崎狐」. Some see it as a Yokai. It used to be known in the Chichibu area and then spread all over Musashi province. Before choosing a bride or groom, on has to carefully investigate the family to make sure it does not live with the family and comes along. The bride might give birth to foxes and leaves the family soon after giving birth. 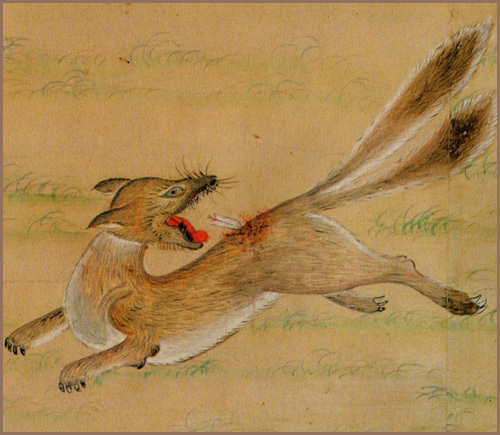 Some Kitsune-women also give birth to mice before disappearing, and the whole family becomes unhappy and unlucky.
. The 怨念 grudge of Taira no Masayori 平将頼 (? - 940) . Around 1640, there lived a priest in Hiki who performed austere practises and venerated 大日如来 Dainichi Nyorai. He later went up to 羽黒山 Mount Hagurosan, There he had a dream vision about the servant Takejo (Bamboo woman) who lived in Sakuma. So he went back to Edo and Sakuma and prayed in front of Takejo. Takejo was ill, but his prayers helped her to die in piece, wrapped in a purple cloud on her ascent to paradise.
. Haguro San 羽黒山 . 羽黒出羽三山 Three mountains of Dewa - Yamagata .
. Kanda 神田佐久間町 Sakuma cho district .
. buna densetsu 鮒 伝説　crucian carp - kigo and legends .
. yoogooseki 影向石 Yogoseki Stone with Yakushi Nyorai Image .
. matsu 松と伝説 pine legends . When Tokugawa Ieyasu was hunting with hawks, part of the path near 青木村 Aoki village collapsed and he could not go back. The villagers collected all their zeni coins and burried them here to build a bridge.
. yao bikuni 八百比丘尼（やおびくに）nun for 800 years - Legends . 武蔵国足立郡水波田村 In the Adachi district, at the temple 慈眼寺 Jigen-Ji, there was a huge enoki 榎 nettle tree cut down, the open cut covering a huge size of the ground. This tree had been planted by a Happyaku Bikuni nun from 若狭 Wakasa. When the villagers dug deeper, they found the statue of Jizo Bosatsu in a stone box, with an inscription dating to 大化元年 the year 645. This Bikuni must have lived for more than 1000 years. In 武蔵国多摩郡久保村 the village of Kubomura in Tama there lived a farmer named 藤五郎 Kikugoro, whose son named 藤蔵 Fujikura died when he was six years old. At the funeral there came an old man with white hair and took away the spirit of Fujikura (some say the body of the boy who was still alive). Fukukura lived in a dark place for three years and then came back to the world of men. Now he was born in the same Tama district in the village of 中野村 Nakano as the second son of 源蔵 Genzo, named 勝五郎 Katsugoro. When Katsugoro was nine years old, he said he was in fact the son of Kikugoro and could tell all the stories of Kikugoro's family and the son Fujikura. In the year 1005 during the reign of 一条天皇 Emperor Ichijo Tenno suddenly it begun to rain 幣 ritual wands and huge fangs from the sky in 武蔵国日比谷村 Hibiya village.
. 芝大神宮 / 芝神明社 / 芝神明宮 Shiba Myojin Gu . （八岐大蛇、八俣遠呂智、八俣遠呂知　ー　ヤマタノオロチ）- a legendary 8-headed and 8-tailed Japanese dragon. When the deity 素盞鳴の尊 Susanoo killed the huge serpent of Yamata there have not yet been metal swords in Japan. The first 鉄剣 iron sword is said to be in the shrine 石神井神社 Shakujii Jinja at the 武蔵国豊島郡下石神井村 Shimo-Shakujii village in the Toshima district.
. Shakujii Park 石神井公園 Shakujii Kōen .
. Hatagaya Fudo 幡ヶ谷不動 / 荘厳寺 Shogon-Ji . 藤原秀郷 Fujiwara Hidesato came here to pray for victory against 平将門 Taira no Masakado.